Hyaluronic acid (HA) is a glycosaminoglycan composed of alternating D-glucuronic acid and N-acetyl- D-glucosamine monosaccharide residue. These are cross-linked to form long unbranched chains, which form an anionic biopolymer. The 3-dimensional structure forms a space-occupying molecule, and the chemical makeup draws a large volume of water to the compound. Due to its combination of properties, endogenous HA contributes turgor and elasticity to the dermis. Hyaluronic acid has become the leading dermal filler due its combination of low allergenicity, high biocompatibility as demonstrated in ocular and intra-articular uses, and longevity. It is suitable for injection into facial skin, where, in addition to providing immediate and short-term augmentation, it appears to induce longer-term effects by stimulating collagenesis by native fibroblasts.1,2 Improvements in its in vivo longevity by cross-linking have further boosted its popularity. To maximize its utility and range of applications, HA has been prepared in a variety of forms, which vary in viscosity and formulation. Hyaluronic acid's viscoelastic properties are a function of the length of the molecular chains of the polymer, cross-linking, concentration, and particle size.3 Medium viscosity HA is best for moderate lines and wrinkles, such as glabellar lines and nasolabial folds. It is injected into the mid-to-deep dermis. Finer HA formulations are available for correction of fine facial lines, such as perioral and periorbital rhytids, and are injected in the superficial dermis. Specialized formulations are designed to be injected into the lip, while others indicated for restoring volume lost due to natural aging or HIV-related lipoatrophy are injected into the subcutaneous or supraosteal regions. Restylane® Vital is a low-viscosity HA gel, available in 12 mg/mL or 20 mg/mL. It is injected with a metered dose injector that deposits 10 μL per injection site (Figure 1). Given the properties, superficial injection, and microdosing delivery technique, Restylane Vital is an excellent candidate product for the treatment of ice pick acne scars. Twelve patients, whose moderate to severe ice pick acne scars had responded well overall to fractional laser resurfacing but who exhibited residual deep focal ice pick scars, were treated with Restylane Vital. The improvement was immediate, as expected, and the treatment was well tolerated by all patients. 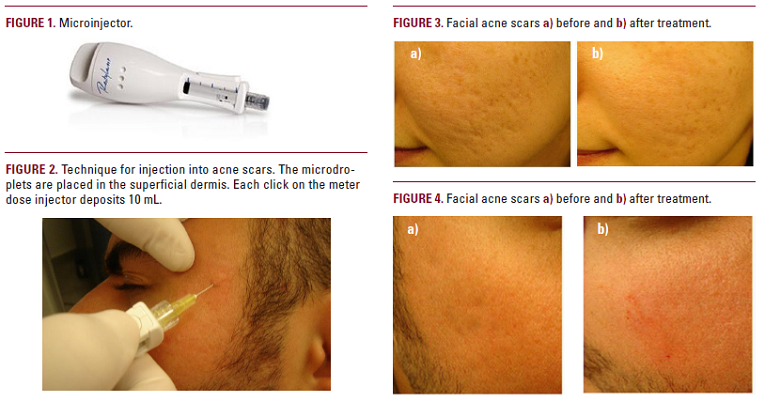 Restylane Vital therefore appears to offer an improved treatment modality for the treatment of acne scarring.